Habib Ali al-Jifri is an extremist Sufi and saint-worshipper who actively calls to saint-worship. His affair is clear and known and the Scholars of Tawhid and Sunnah have spoken of him and his devations and stated that he is a caller to Shirk. His khuraafaat (superstitious deviations) are very many and can be found in abundance on the tube and elsewhere. The three names mentioned by Habib Ali al-Jifri are all Qutbiyyah. They are followers and promulgators of the doctrine and ideology of Sayyid Qutb who is a Rafidi (see here), takfiri (see here), Khariji (see here), Jahmite (see here). Sayyid Qutb is one of the two major ideologues of the Muslim Brotherhood, the other being Hasan al-Banna. Between them, they outlined the two strains of Ikhwani thought and ideology represented by a) uniting all the sects and groups into one mass, coupled with b) mass Takfir of governments (and societies) and promoting ideological, then practical revolutions to replace them. This poison was taken by them from the Marxists, Leninist, Communists, and how insightful was the remark of Allaamah Ahmad Shakir over 60 years ago, "The movement of Shaykh Hasan al-Banna and his Muslim brothers (i.e. Muslim Brotherhood), those who have overturned the Islamic da'wah into a criminal destructive da'wah, is financed by the Communists and Jews as we know that with certain knowledge." (see here). Salman al-Awdah, Aa'id al-Qarnee and Muhammad Hassan are all upon this fikr. They combine between Irjaa' towards the innovators and Khaarijiyyah towards rulers and Scholars, and some of them do so deceptively under the banner of Salafiyyah which is free of them and they of it. When they show such indifference to the zandaqah present in the books of Sayyid Qutb (of Takfir of the Companions, statements of kufr, the doctrines of the Jahmiyyah, Mu'tazilah, Marxists and others) and raise him as an "Imaam of Guidance" and treacherously put him alongside Shaykh al-Islaam Ibn Taymiyyah and Shaykh al-Islaam Ibn Abd al-Wahhaab (as is done by Safar al-Hawali in one of his works) then what else is left but to open their arms to saint-worshippers? 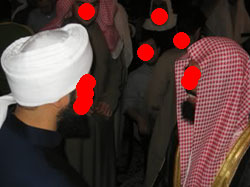 That's why you see all the innovators and deviants finding refuge, sanctuary, friendship and accommodation with these Ikhwanis, whilst in their hearts (of these Ikhwanis) there is detectable aversion and resentment towards the Scholars and rulers of Tawhid and Sunnah - as is clear from their outward actions, dealings and behaviour. That my son accompanies a sinful and cunning scoundrel who is a Sunni is more beloved to me than that he accompanies a devoteful and worshipful Innovator. I forbid [you] from fornication (zinaa), stealing and drinking wine. However that you meet Allaah with any of these sins is better to me than that you meet him with the view of Amr bin Ubaid and the associates of Amr (i.e. the Mu'tazilah). That apes and pigs are are next to me in a house, is more beloved to me that a man from the people of desires (deviations, innovations) should be next to me (as a neighbour). These statements from the Salaf are in relation to the Ahl al-Kalaam and the bid'ahs of the Jahmiyyah, Mu'tazilah. Salman al-Awdah, Aa'id al-Qarnee, Muhammad Hassan and their likes open their arms and cooperate with those who call to Shirk with the Lord of the Worlds, let alone divest Him of His attributes.